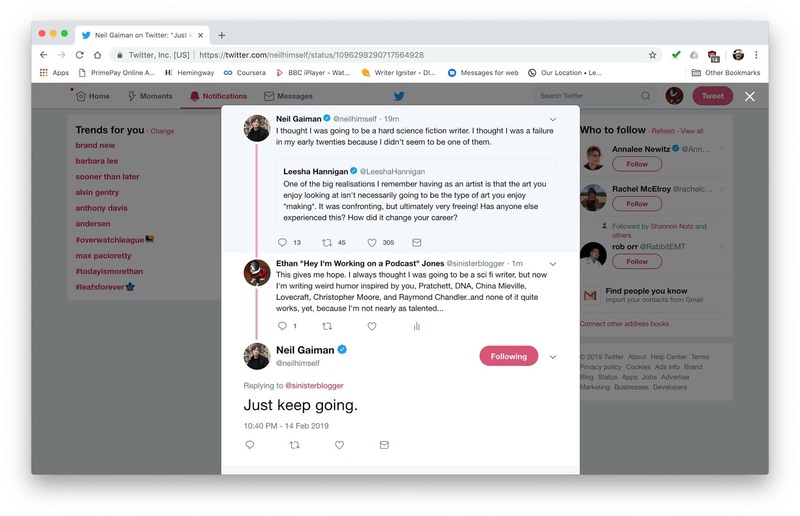 Last night, Neil Gaiman himself took a few milliseconds out of his day to respond to a tweet I sent him. His response - three simple words, "Just keep going." No kidding, no snark, dead serious - this meant something to me. Tonight I used a prompt from my 10 year old nephew as a way to flex my writing muscles in preparation for the daunting task I have set myself for my upcoming podcast, Write Sinister, which you can read about at the link. My nephew asked me to write him a story based on the prompt, "What you most dread." This is what I came up with for him. Dear everyone else in the world: Most Americans didn't vote for this hideous, racist, incredibly stupid, obstinate, *expletive deleted*, unbelievable jackass. We are SO SORRY that he got elected anyway. We have a very stupid system and we really, really need to kill the electoral college. Please don't judge our country by this hideous orange terrible, terrible person's behavior. We'll fix this. We promise. Just hang in there until then. Please. We're really, really sorry. Sincerely, Most of us. Podcast Progress - It has a Facebook page and a New Idea! Write Sinister officially exists! On Facebook. Give me a genre. Give me a character. Give me a thing, an object, a situation, a scene, a first line, a type of cheese, a small animal, a smell, a specific number of words, a word that I CAN'T use. Give me weird. Give me funny. Give me serious. Give me something you think nobody could possibly make a good story out of. These prompts from all of you, the ephemeral and not yet listening listeners, will form the basis, the crux, the core, if you will, of this podcast. I will start writing from your prompts as soon as I receive one that tickles my fancy, and my fancy is fairly easily tickled. And then I'll read your prompt, and my story, on this podcast. Q and Bond are walking down a surprisingly long hallway. Q: James, did you get the wristwatch? Q: The wristwatch I sent you. Bond: You sent me a wristwatch? Q: Yeah, I sent you a wristwatch. It explodes when you hurl it at people. Bond: You’re telling me it explodes when you hurl it at people? Q: Yeah. It explodes when you hurl it at people. M comes out of a doorway and joins them. They continue walking. Bond: Hey, M, did you know that Q gave me a wristwatch that explodes when you hurl it at people? M: It explodes when you hurl it at people? Q: Yeah. And Bond lost it. Q: Then why did you...never mind. They reach an office with a big sturdy desk. Bond leans back against it and crosses his legs. Bond: You know, Oliver Cromwell used to say this about wristwatches.